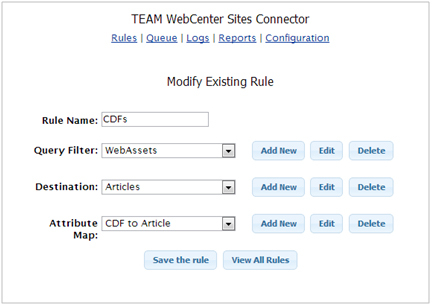 WebCenter Sites and Site Studio – Working Together? There have been many questions from our customers who use Site Studio concerning what they should do with WebCenter Sites – Do I use both? Do I migrate? What is my first step? We have upcoming posts that can help you start deciding what to do, but whether you want to just reuse some of the information in your Site Studio data files or perform a permanent migration to WebCenter Sites, our Sites Connector and consulting services can help. Here is the definition of the attribute map “CDF to Article” used in our rule. You can see that we are mapping static text literals, data file text elements, data file image elements, and metadata values to Sites attributes using this attribute map. After the rule is enabled, the replication originates from WebCenter Content either immediately or on the next scheduled event. Using the Site Studio Contributor and the WebCenter Sites Contributor “Form” view we can see the results of the replication process. 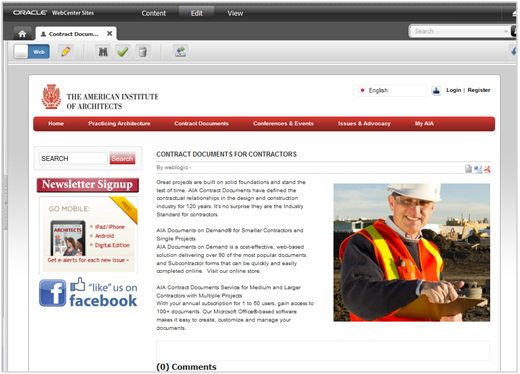 Here is the same page shown in the WebCenter Sites Contributor “Web” view. You can see the use of the Subtitle, Copy, and Image File attributes in use on the website. If our rule was left enabled and the Site Studio page updated, the changes would be replicated again and content in WebCenter Sites updated to reflect the change. 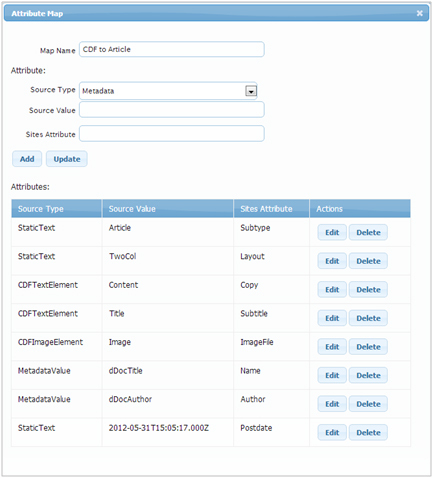 In our example we replicated metadata, static text, an image element, and text elements from WebCenter Content Site Studio to WebCenter Sites. Our Sites Connector can also handle the replication of multiple image renditions created by digital asset management as well as be extended to handle your complex custom elements. To learn more please contact us. To read about our recent project performing a migration from Site Studio to Sites using our Sites Connector click here! This entry was posted on Friday, May 31st, 2013 at 11:43 am and is filed under Oracle, TEAM Products, WebCenter Content, WebCenter Sites. You can follow any responses to this entry through the RSS 2.0 feed. You can leave a response, or trackback from your own site. One Response to WebCenter Sites and Site Studio – Working Together?